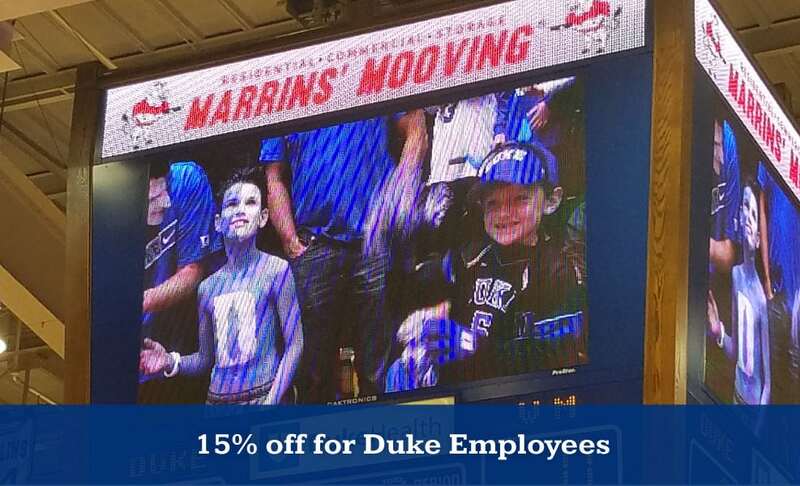 Marrins Moving is happy to be a trusted partner of Duke University. Planning on moving soon? We offer 15% off labor charges to all employees of the school. Check out the gallery below to learn more about our current offers and events. We’ve been providing moving service across the Triangle area for nearly two decades now. In that time, we’ve become the number one choice for helping Duke University staff and students get moved. It all comes down to our dedication to our customers. Marrins offers fast, reliable service delivered with care and attention to detail from a team of seasoned moving experts. We ensure your move goes smoothly and that everything makes it one piece. Contact us or call us at (919) 551-3530 to learn more.